State Systems, Inc. proudly specializes in the installation of carbon dioxide (CO2) fire suppression systems in commercial buildings and facilities throughout Tennessee, Mississippi, and Arkansas. The advantages of CO2 gas for fire extinguishing purposes have been long known, and the gas has been used for fire extinguishing since as early as 1914. As the original “clean” agent, carbon dioxide suppresses fires without leaving behind an agent (or residue) that could potentially damage expensive, sensitive equipment. CO2 effectively extinguishes fires by physically attacking all three points of the fire triangle: fuel, oxygen, and heat. These systems are completely safe and recommended for commercial and industrial properties in high fire hazards in non-occupied areas. Call us at 866-308-5701 or contact us online to learn more about CO2 fire suppression systems or to have one installed in your building. Keep reading to learn more about each system, or call us today to request an estimate. Ansul High Pressure Carbon Dioxide Systems are recommended for hazards like semiconductor wet benches, control rooms, and paint lines. Whatever the application, from cylinder to nozzle, each system is custom-designed for your specific fire hazard protection needs. High pressure systems use individual storage cylinders—up to 100 lb. capacity each—that can be manifolded together for rapid simultaneous discharge. Cylinder valves can be opened automatically or manually, from local or remote locations using electric, pneumatic, or mechanical valve actuators. Ansul Bulk Low Pressure Carbon Dioxide Systems are for fire hazards requiring large amounts of extinguishing agent in a limited amount of space. A single bulk tank can store from 3/4 to 60 tons of carbon dioxide, which is maintained in a stand-by fire ready state—allowing the system to provide effective distribution of agent on demand. Contact us for more information on Ansul Bulk Low Pressure CO2 Suppression Systems. 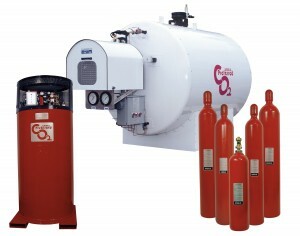 The Kidde CO2 system includes detectors, a control unit, agent storage cylinders, piping, and discharge nozzles. Gaseous carbon dioxide rapidly suppresses fire by a combination of cooling and oxygen displacement. Discharge duration and agent flow rates are customized for the individual application and installation in your facility. Call us today or contact us online to schedule service or request an estimate!